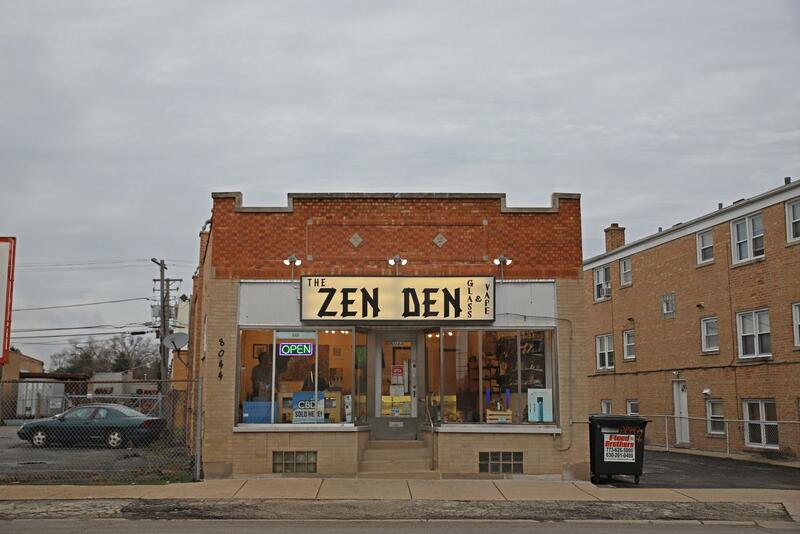 The Zen Den in River Grove, Illinois where Pete Rivers blows and sells glass and vape products to cannabis lovers. In a small shop on a busy street in River Grove, Pete Rivers is dancing a mesmerizing ballet around a torch spitting a 2-foot-long, 3000-degree flame. Rivers is a glassblower. Today, he’s making a bubbler, but he didn’t know that when all he had in front of him was a half-dozen rods of borosilicate glass. Blowing glass is like meditating, Rivers said. Clear your head, let your hands go where they go, and the piece will come together if you let it. For as much as blowing glass is about being in the moment, it’s equally about thinking ahead. Everything he’ll be working with has to be heated to 1000 degrees in a special oven just so it won’t shatter when he brings it to the flame. When he’s spinning colors into intricate designs onto a piece—today he’s doing something called a “wig-wag”—he has to anticipate what they will look like when he blows the glass out. Pete Rivers works on a part to one of his glass pipes. Gravity is both your friend and your enemy as a glassblower. When the glass is molten and glowing red hot, it wants to droop down to the floor, so you have to constantly keep it rotating. But rotate it too quickly and it wants to pull itself out. Rivers, 34, has been blowing glass since he was 25. He grew up in West Humboldt Park, where he had a rough upbringing. He was shot in the chest when he was 14 while he was just walking down his block. His uncle was killed in the shooting. But now he lives in River Grove, a suburb just outside Chicago’s city limits. His kids like it more here. The people are nicer. 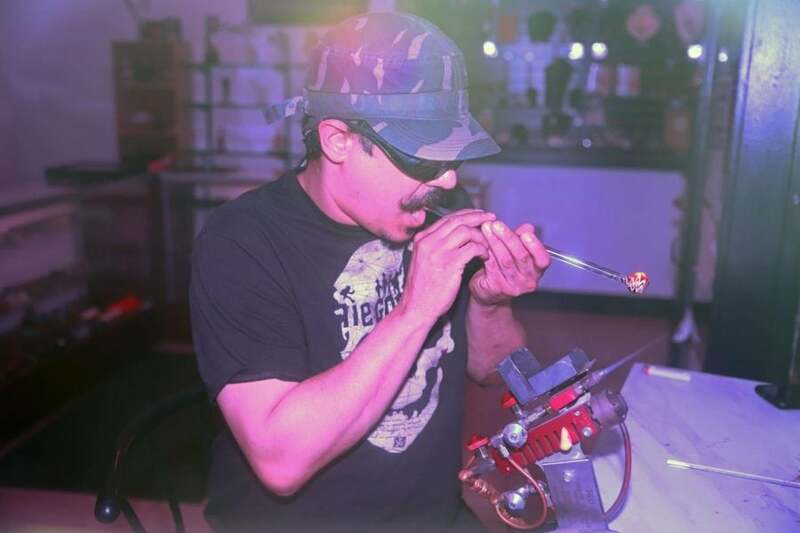 He started blowing glass when he brought an idea for a custom piece to a local artist called Ghost—an artist who Rivers still admires and calls one of the “best sculptors alive.” The cost estimate was $5,000—he only had $500 at the time. Rather than giving up, he offered him $500 to teach him how to blow the piece himself. For Rivers, becoming a glassblower was the next logical step after getting out of his old neighborhood. The glass Rivers uses fluctuates in its material states. In its raw form, it’s just a tube of hardened glass. But put the flame to it and begins to turn into a viscous liquid. He pulls and bends, discards this little chunk, folds that one over and twirls it around and pulls it back over itself. He does all while keeping his hands, the most important tools of his trade, a safe distance—normally five or six inches—from the massive torch. Rivers has never seriously burned himself. The most he’s done is touched something that’s hot, but he knows people who, while twirling and tucking and spinning, have found their hands on the wrong end of the torch. The torch burns an ultra-hot mixture of propane and oxygen. Just a millisecond of contact with that torch is enough to make sure that you won’t be blowing glass with that hand anytime soon—if ever. Being even in the general vicinity of the torch is quite the sensory experience. You can feel the heat from feet away, and the roar of the torch forces you to speak up. When Rivers switches over to a smaller torch, the remaining oxygen being expelled lets off a loud “pop” like a firecracker just went off — he apologizes everytime this happens. He still hasn’t worked out the kinks in his homemade tubing system. The light is blinding like a welding torch, so Rivers wears welding goggles. Working with glass changed Rivers’ life. Before glass, he was just a cog in a giant telecommunications machine. Now he’s a small business owner and reports to no one but his own bottom line. It’s changed his attitude toward life and gives him a feeling of purpose. You can visit the Zen Den and watch Rivers blow glass or do some shopping at 8044 W. Grand Ave., River Grove, Illinois.